Munce Discovery Burs are carbide endodontic burs designed to uncover hidden canals, locate separated instruments and core-out fiber posts. In contrast with ultrasonic tips, these burs are heatless and do not create a fine powdery dust. The burs are latch-style and autoclavable. Munce Discovery Burs are available in three styles: Deep Troughers, Shallow Troughers and Endodontic Cariesectomy Burs. Deep Troughers are 34 mm in length and Shallow Troughers are 31 mm in length. Both styles of Troughers are manufactured with a round carbide head and a narrow, non-flexible shaft to facilitate positive control for deep troughing. The combination of the narrow shaft with the added length provides a functional view corridor beyond the handpiece head. Both Deep and Shallow Troughers are available in six head sizes (#¼, #½, #1, #2, #3, #4). The Endodontic Cariesectomy Burs are available in #6 round head size with a length of 31 mm and the distinct narrow shaft. Munce Discovery Burs are available in variety packs or in individual sizes. This product was evaluated by 23 consultants in 331 uses. These endodontic burs received a 97% clinical rating. The long narrow shafts of Munce Discovery Burs provide dentists with excellent visibility beyond the head of the handpiece, allowing a better view of deep target areas. Seventy-five percent of consultants who used ultrasonics found Munce Discovery Burs to be equivalent or better at opening calcified canals. They produce less dust than ultrasonic tips and create a smooth surface that is easy to read. Ninety-five percent of consultants rated Munce Discovery Burs better than other endodontic-length carbide burs they were using and 5% rated them equivalent. 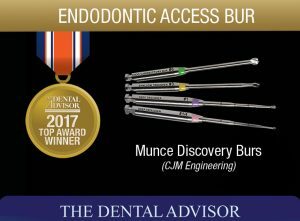 Ninety-one percent would switch to Munce Discovery Burs and recommend them to a colleague. For best results, use magnification of 2.5X or greater. Use slow speed to avoid being overly aggressive. When looking for hidden canals, use very gentle pressure, allowing the bur to selectively remove calcified material.